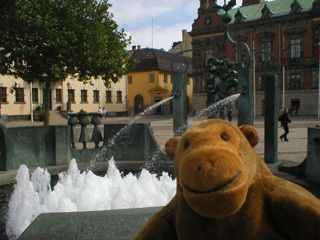 "This is an interesting fountain"
In front of the Rådhuset Mr Monkey found a complicated fountain arrangement. 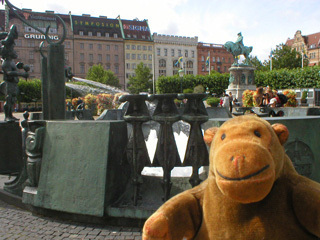 It was built in 1964 and depicts many important events in the history of Malmö, as well as splashing lots of water about. Unfortunately, it doesn't explain what they all are. 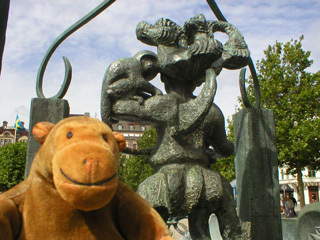 Mr Monkey was fascinated by the monkey on the standing figure's shoulder, as it seemed to have a face on both sides of its head.